. 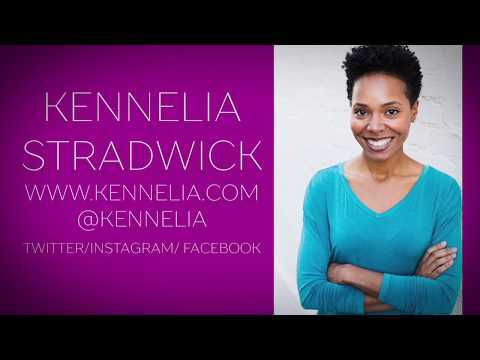 : Kennelia Stradwick | CMEG :. Born and raised in the “Blue Collar” city of Flint, MI, this youngest daughter of 2 always knew that her sharp wit and fun-loving personality would take her far. But Kennelia Stradwick didn’t truly realize her love for entertaining until she was awarded “Class Clown” her senior year at Flint Central High School. She continued her education and graduated with a Bachelor’s Degree in Aviation Management from Hampton University, where she was involved with numerous on-campus organizations, but quickly realized that Aviation wasn’t her passion. She took her degree and moved to New York City, where she got her start in entertainment by attending various classes at the Stella Adler Acting Studio, HB Actor’s Workshop and The People’s Improv Theatre (P.I.T. ), where she occasionally performed Improv sketches alongside other up and coming performers. Kennelia eventually decided to take her talents to Hollywood to further pursue her career and ever since, this talented and driven Stand-up Comedienne, Actress and Host has been taking the Los Angeles entertainment scene by storm. Kennelia has performed all over Los Angeles, including venues such as The “World Famous” Comedy Store, Hollywood & Brea Improv, Ice House Comedy Club and Flappers Comedy Club, just to name a few. Most recently, she was the morning Traffic Anchor on ABC10 (KXTV) Sacramento’s “Morning Blend”. An on-air host on AfterBuzz TV Network; an online broadcast network, created by E! Host Maria Menounos & Keven Undergaro. And as co-creator & host of “Happy Hour; A Shot of Conversation”, listeners can tune in via iTunes for a dose of Kennelia’s style of comedy on a weekly basis. She can also be seen on networks such as FOX, CBS & HULU, including a recent co-star appearance on “Superior Donuts”, a featured comedian on “Laughs”, and in numerous web-series, national commercials and print campaigns. As well as on DASH Radio’s “The No Flex Zone” show, alongside comedian/actor Flex Alexander & comedian Buddy Lewis. This young woman has a solid commitment to entertain through her sharp, care-free and emotional performances. And with her fun and engaging style of comedy, Kennelia Stradwick is proving to be a truly versatile talent in Hollywood, as this Entertainer is on the rise.